We toured hundreds of impressive new models at this month’s RV Experience event. These six stood out. At the RV Experience trade show earlier this month in Salt Lake City, we got a look at the latest models of trailers, vans, and full-on buses impressively Tetrised into the Salt Palace Convention Center. After playing around in numerous models, here are our six favorites. 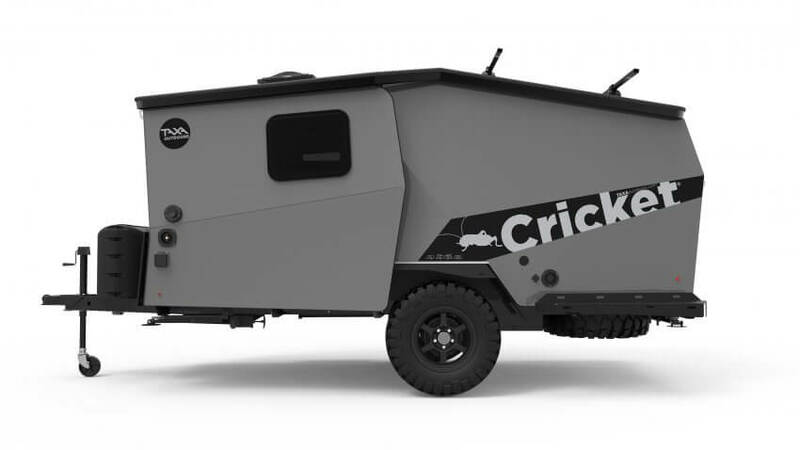 The Cricket looks vaguely like a spaceship (in a good way), made of aluminum panels set on a galvanized steel frame. That brings the weight to about 1,450 pounds, meaning many four-cylinder vehicles can pull it from garage to campsite. 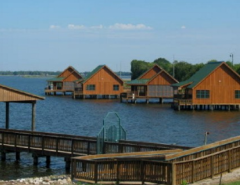 Though with integrated plumbing and electricity, room to sleep two adults and two kids, underbed storage, a pop-up ceiling for ample headroom, and big windows for taking in the scenery, you might be inclined to live in it full time. 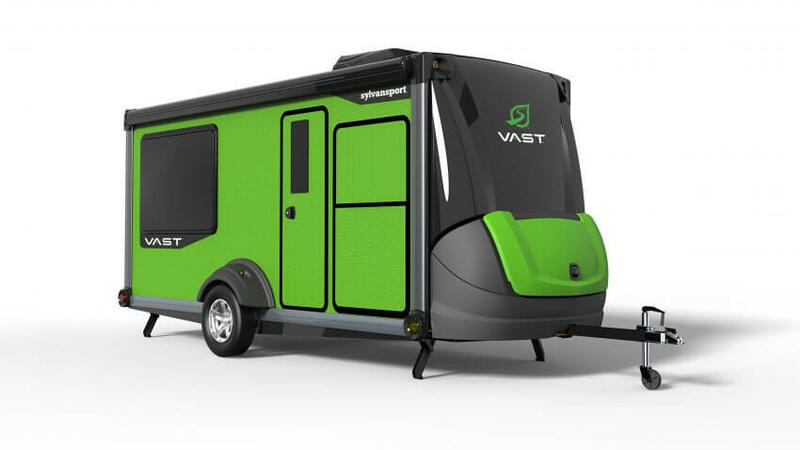 SylvanSport makes a range of gear—like a sleeping bag and camp-kitchen products—in addition to its Go Easy and pop-up Go trailers. This year the company built on its line with the hard-bodied Vast, which is an impressive transformer. Load gear like bikes through the rear hatch and store them behind the bench, or fold the seats down so that the queen bed can lower from the ceiling when it’s time to call it a day. The kitchen can remain inside, but if you feel like cooking in the fresh air, it also slides out the side of the Vast (at the same time revealing the shower). And the dining table can be shifted out the open window to form a sort of bar. Racks on the trailer’s left side are good for mounting two kayaks. 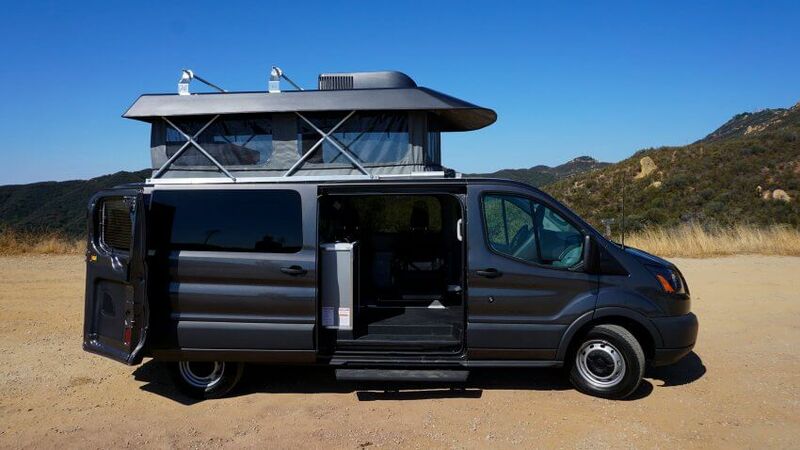 Constructed on a Ford Transit 150 chassis, the CV1 has a “downstairs” and an “upstairs,” in that the roof pops skyward, granting passengers more than six feet of headroom and giving the van space for two beds, one on an elevated platform and one on the ground floor, so to speak. In addition, it’s kitted out with a full kitchen (a two-burner propane stove, sink, and refrigerator), a toilet with a tank good for 56 flushes before it needs emptying (though no shower), a 14,000-BTU furnace that runs off the same propane as the stove, and seating for up to five. 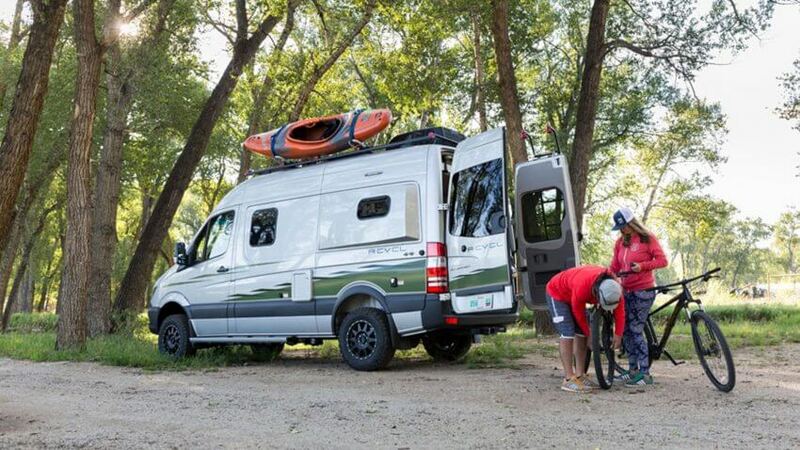 The Revel, like the CV1, is for those who want to avoid the hassle of towing a trailer. Unlike the CV1, though, it’s built on a Sprinter chassis, meaning four-wheel drive comes standard. You’ll pay for that, but as we wrote in our full review of the Revel last month, it can get you places you wouldn’t dare drive most other camper vans. It otherwise has many similar features to the Mod Vans model. You won’t find a pop-up roof, but the Revel does have an outdoor shower, a bed that descends from the ceiling (which you can store large gear under, even when it’s fully lowered), and a diesel-fed hydronic heating system that runs through the van’s insulation to make camping in subfreezing conditions feasible. You can opt for either an indoor shower and a toilet or a closet with a drain in the floor for drip-drying damp clothes. But we would’ve liked to see full shoulder seat belts, not just the lap variety, on the rear seats. 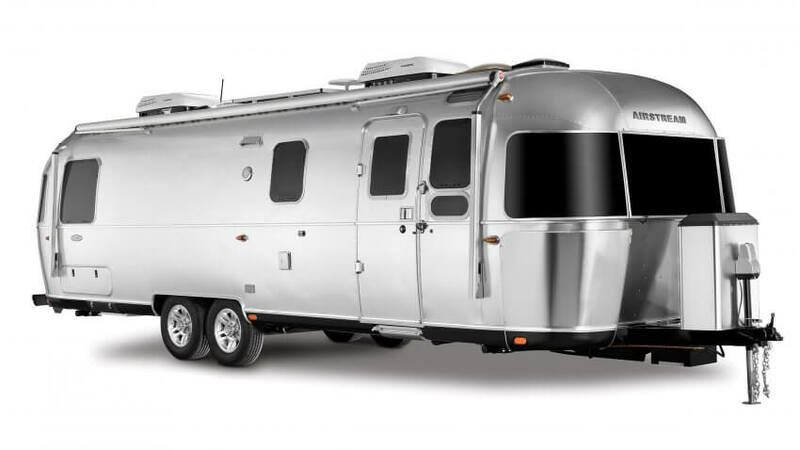 The geek’s RV, Airstream’s Classic Smart is a connected home on wheels. You can operate everything—including the lights, awning, and climate control—and monitor the propane, water, and battery levels from an app using 4G or Wi-Fi. The Classic has other “dumb” but equally luxurious features, like a 60-inch projection TV, heated shower floors, an oven, and wood cabinetry. The head of the queen bed adjusts up and down, and, yes, there’s a doorbell. 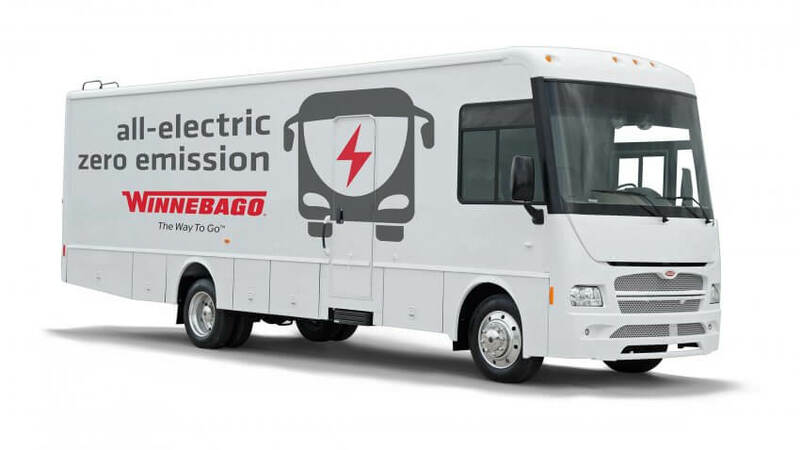 Though the All-Electric has a top range of only 125 miles on a full charge, and the model we saw at RV Experience was fairly bare-bones, we applaud Winnebago for making a full-size bus that has no emissions. This rig is meant more for commercial use, but it was awarded the top spot in the sustainability category at the show, and hopefully the tech will become more widely used.